Samantha, your wedding was unlike anything we have been before. So unique across all details. What was your vision for your wedding day? Thank you so much. 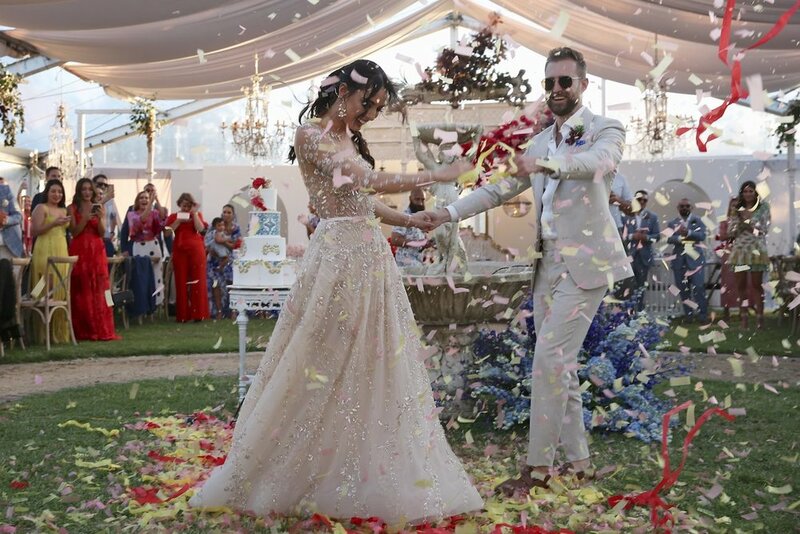 Our vision for the day was to give our guests a truly unique and unforgettable Wedding experience. 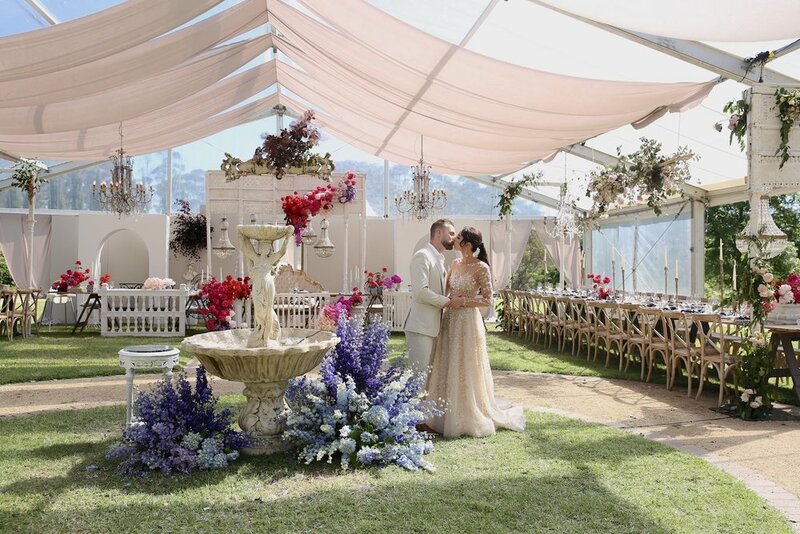 We wanted to make our guests feel as if they had been magically transported to a garden in Italy for the day and so every choice we made in terms of Venue, drinks, food & styling were all made to keep with this Italian Garden vibe. 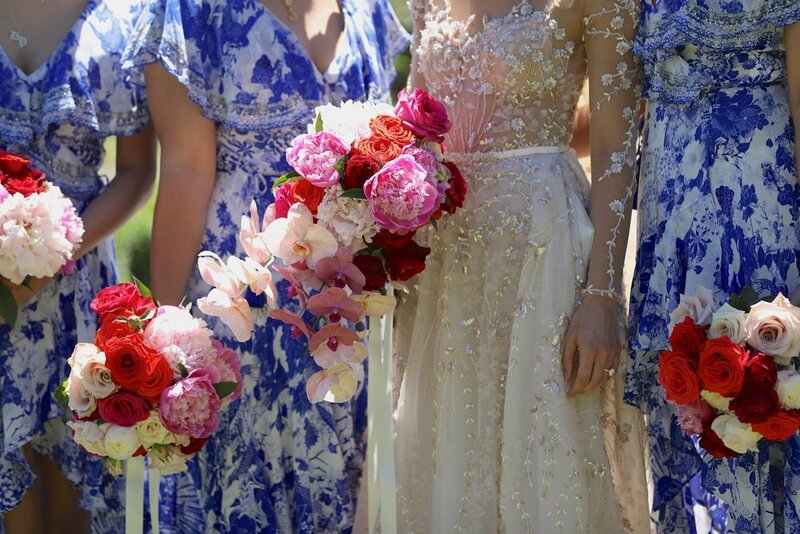 I am completely obsessed with flowers, so it was no surprise that this was a huge part of the vision for me, as was infatuation for gold, baroque details & blue-white porcelain prints. (This is literally the styling of our house too). Overall, we just wanted the day to ooze with vibrancy & personality and to ultimately be a true reflection of Tim & a homage to the things in life that we love. 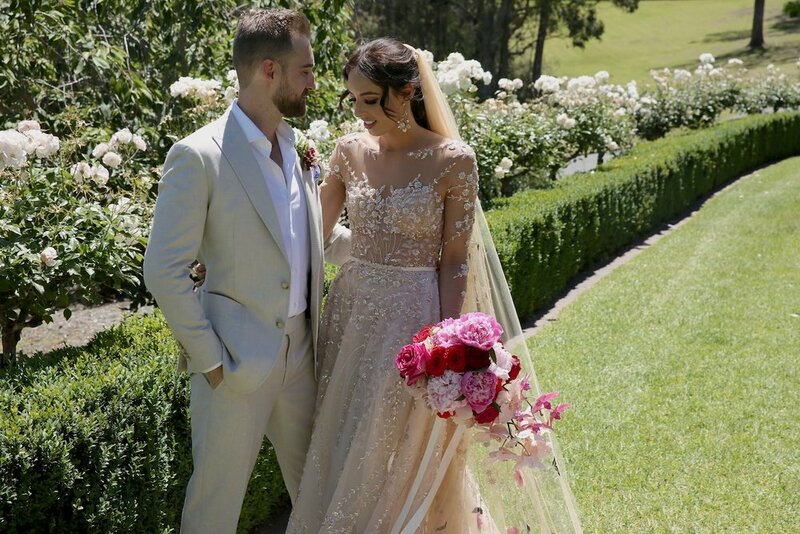 What drew you to Helen Rodrigues Bridal and at what moment did you know your Lee Petra Grebenau gown was ‘the one’? Like most brides, immediately following my proposal, I began following a multitude of bridal-related pages on Instagram. One of these pages was Helen Rodrigues and I quickly learned that the Boutique exclusively stocked many of the International Designers I had been lusting over. 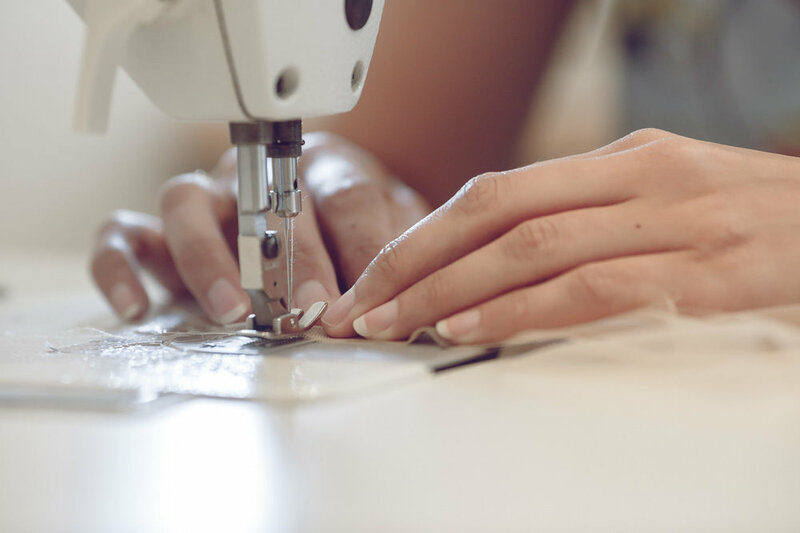 I had taken a particular interest in the designs of Israeli designer, Lee Petra Grebenau, so when I found out that Helen Rodrigues was hosting a trunk show of her full collection, I immediately booked myself in. I had come with in with my heart already set on a particular dress (the Sansa gown), but was encouraged by my sisters & Helen to try on several. Luckily I listened, because a completely different and unexpected dress suddenly crept into the picture. 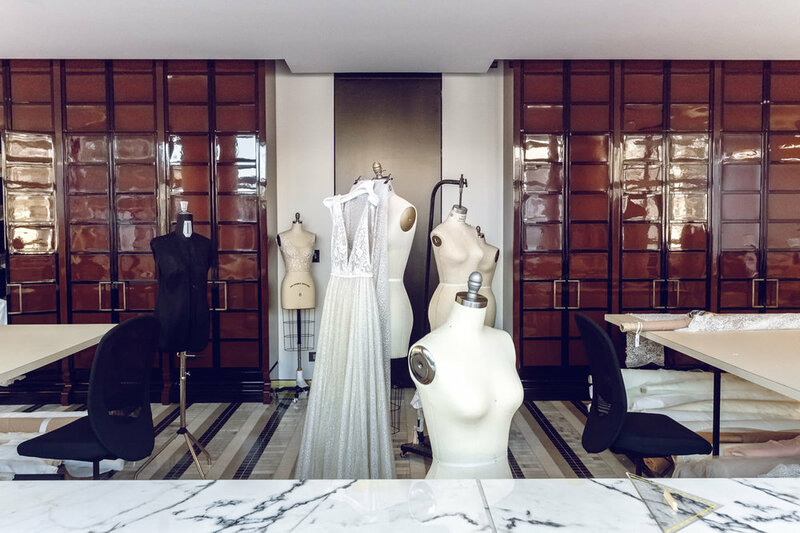 I left the Boutique in utter delight, knowing that I had found not one, but two phenomenal dresses, but in the back of my mind I knew I had one hell of a decision on my hands. The next time I went back I still had not made up my mind and it was ultimately the reactions of my sisters & mum that cemented my decision to choose the beautiful Giselle gown I wore. How did you decide to accessorise your gown? The Gown itself had so much beautiful & intricate detail, that I felt that jewellery could be kept to a minimum. I opted to wear my hair up and out of my face & decided that a statement pair of earrings would be the only jewellery I would wear (aside from rings of course). I had ordered earrings online, which did not arrived on time. As if it were truly fate, just days before the wedding at my final fitting with Helen I suddenly spotted the most devine pair of Keren Wolfe earrings on display. They ended up being a match made in heaven for the dress. The other accessory I did not hold back on was my veil. It was a hand-beaded, 3D floral masterpiece that was designed by my sister/Maid-of-honor for me. No one had ever seen anything like it before & it was truly something very special. What was your beauty routine in the lead up to your wedding day? About a year out from the Wedding I decided to up the anti with my skincare and began using the Rationale essential six product range for my daily routine. I also had regular facials in the lead up at Rationale. Aside from that I just tried to exercise daily, eat a balanced diet & to make sure I was getting enough sleep. What was your experience like as a #HRRealBride? With so many other tasks to worry about, it was so nice and relaxing to know that I was in the best hands. Helen & her team are so warm & genuine that I honestly felt so at home and relaxed every time I was in the Boutique. They offered the perfect amount of guidance and advice when it was needed, but ultimately gave me the time & space I needed to arrive at each decision on my own. When my dress arrived, the measurements that Helen had taken were so precise that it literally fit like a glove on first fitting. I could not recommend Helen & her team more highly to future brides. The whole day was such a dream. There are so many highlights, but I will say that I cannot get over the pure joy I felt during our newlywed moment, walking back down the aisle hand-in-hand as husband and wife for the first time. We were smitten & you could not wipe the smiles off our faces. What was your greatest learning through your wedding planning journey? I already knew this, but the whole Wedding process also served as a huge reminder of just how incredible my Husband is. Whilst I planned all the details of the day, if it were not for him there seriously would not have been a Wedding on the day. He literally project-managed the entire Wedding seamlessly & coordinated all of our Vendors during the week of the build & the pack-down like a pro. I am a very lucky girl. What advice would you give other brides when it comes to selecting their own wedding gown? Don’t play into the trends too much. Go for something with timeless elegance, so that you will not find yourself cringing at your own Wedding photos in years to come. Also put priority on comfort, you need to be able to walk, hug, dance & enjoy yourself. Finally, be true to yourself & choose a dress that is representative of you & your style.